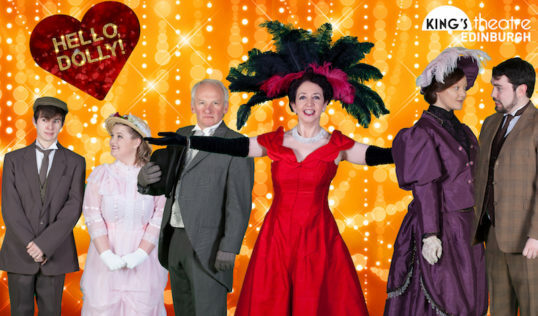 Southern Light Opera are bringing a classic home this week, when they open their production of the great musical Hello, Dolly! at the King’s on Wednesday 7 March 2018. The musical itself premiered on Broadway in 1964, with Carol Channing as widowed matchmaker Dolly Gallagher Levi. 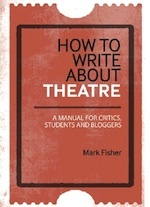 But it is based on Thornton Wilder’s hit play The Matchmaker which had its own world premiere at Edinburgh’s Royal Lyceum, at the Edinburgh International Festival of 1954. The original production ran for over seven years and won a record-breaking 10 Tony Awards. It has been produced and revived all over the world regularly and the recent Broadway revival, firstly with Bette Midler and now starring Bernadette Peters, remaining the hottest ticket in New York. Set in the 1890s, the musical follows the exertions of Dolly as she travels to Yonkers, New York, to find a match for the miserly “well-known unmarried half-a-millionaire” Horace Vandergelder. Her cunning, and a series of comic romantic entanglements, ensures matrimonial unions for others. But can she match it with her own catch? 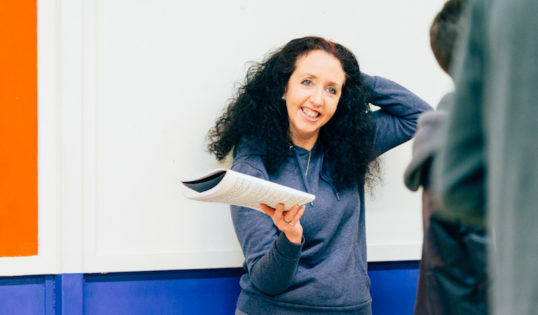 Picking up the title role and stepping into Channing’s shoes is Elspeth Whyte, who has appeared with many companies in Edinburgh and the Lothians. She has been part of several award-winning plays, including Black Chiffon with Southern Light Drama and the Livingston Players’ productions of Calendar Girls and Steel Magnolias. She was most recently seen at the Assembly Roxy however, in a rather different role for Threepenny Theatricals production of Elephants when she played one of the Christmas guests at a middle-class household punctured by a situation spiralling out of control. So what made Elspeth Whyte choose Dolly Gallagher Levi as her next outing on the stage? “Strangely I didn’t know the part very well,” she admitted to Æ. “I didn’t see myself as Dolly and only decided to audition after several people suggested I was born to play the part. Whyte has more than a dozen principal roles with Southern Light in her back pocket – including a brace of Wicked Witch of the Wests in the Wizard of Oz, Babette in Disney’s Beauty and The Beast and Meg in Brigadoon. Southern Light’s production has a strong cast of principals to lead the company of over 60 – backed up by a 24 piece orchestra in the King’s pit, under the baton of MD Crawford Moyes. 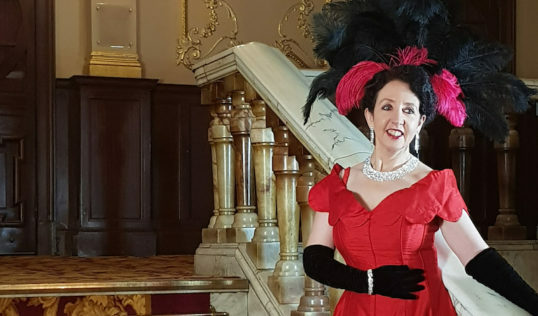 Louise Williamson takes on the role of choreographer for the fourteenth time in her long association with Southern Light. Alan Hunter is taking on Horace Vandergelder with John Bruce and Matthew O’Hagan as his clerks Cornelius Hackl and Barnaby Tucker. Tanya Williamson will play widowed hat shop owner, Irene Molloy, on whom Horace has set his sights, and Nicola Dryburgh is playing her shop assistant Minnie Fay. Direction comes from Andy Johnston, at the helm of Southern Light for the ninth time. He describes Hello, Dolly! as: “musical comedy at its very best – Jerry Herman’s legendary songs and Michael Stewart’s book is a perfect example of a show big on laughs, big on character and big on heart. “It’s no coincidence that the recent Broadway production also starred David Hyde Pierce, one of the finest comic actors of his generation. Evenings: 7.30pm, matinee Sat: 2.30pm .